Having had the opportunity to participate in the May ‘Basic First -Aid Course’ this year, I could not recommend this experience more highly to anyone willing to put themselves out of their comfort zone. I came to Israel not knowing anyone, the language or the culture. And not being Jewish, I could not have stood out more to the other young people also participating on the course. However, all these factors meant nothing during my six weeks abroad. Due to the nature of the intensive first-aid training, that being living in with all the other course members for ten days, and learning from 8:30am until 8:30pm, with inclusive meal breaks, we really had the opportunity to get to know one another. Being a Pro-Israel Christian I found it fascinating learning about the Jewish faith and the many traditions practicing Jews observe. Shabbat quickly became my favorite day of the week, where the everyday worries of life could be put aside and substituted for time with friends without the distractions of the outside world, including those from modern technology. Apart from allowing this relaxing day off, the course was extremely informative, teaching us a variety of first-aid techniques from basic life-support through to preparing us to treat patients in mass casualty situations, should they occur. So after the intensive ten-day training, I qualified as a first-aid responder with loads of new friends. An ideal way for heading into the five-week volunteering period! On shift, as volunteers, we became the third-responder on the ambulance attending all calls no matter what ethnic background or religion. There was always the possibility of life-threatening situations but we were thankful that was not often the case. We routinely checked the vital signs of our patients no matter what the injury or incident. This was the bare minimum that I performed every shift. In more serious cases cleaning and bandaging wounds was also done. And I will never forget having the opportunity of performing CPR on two elderly patients, resuscitating one, but unfortunately later passed away. It was encouraging to know; that after such an incident, there was always someone who I could talk to if I was troubled. Such help was not only available from the crewmembers, but also from the strong MDA support network from the program. Now, not speaking much Hebrew (apart from my Hebrew medical vocabulary of course), I experienced very few issues that could not be solved quickly. Thankfully, being based in Jerusalem meant there were often other English-speaking volunteers who were able to translate if necessary. No doubt, though, an understanding of Hebrew was always an advantage. 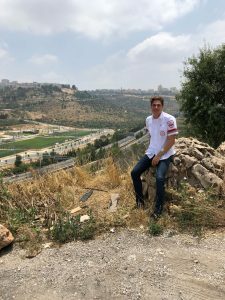 Another positive for my stationing in Jerusalem and having my housing organized through the program, meant living with four other roommates who were also participating in the MDA program. This was not always the case for some who volunteered in other regions. Having an opportunity to reflect on the training course, it certainly does prepare you for the majority of experiences you will encounter. It not only provided the required medical knowledge but the teachers also shared their experiences, which fostered a thorough understanding of what we were to expect. On completion of the entire program, a great medical understanding is backed-up with our personal experiences. Add to that the opportunity of living in Israel, learning to shop, cook and clean has been invaluable, teaching us all to become far more independent! How motivated you are willing to be and what you gain from the volunteering experience is ultimately up to you. You are given total independence in organizing your shifts and travelling from your accommodation to the MDA station. No matter what the situation, there is always something you can do if you are proactive and take the initiative! Once again, I highly commend this volunteer experience to any young people whether they are Jewish or not! Everyone is always made to feel welcome.